We knew it was just around the corner. Our good friend Dave Zatz saw to that, thanks to a bit of clever FCC probing. The FlipShareTV set-top box has finally launched. The device aims to make it easy to share home videos shot on a Flip ‘point and shoot’ camcorder onto the living room TV. Additionally, it can pull down video from Flip’s own video sharing website, so there’s a ‘service’ element too. 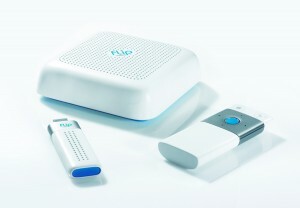 With the advent of mobile phones incorporating better video recording capabilities, Flip’s best bet may well be to emphasis not only the ease of which you can shoot video with its hardware but also that it’s easy to share said content on the web and various other places – TVs and mobile phones themselves. Yes there’s an app for that too, Flip’s iPhone app. But back to FlipShareTV. To be honest, it seems a little convoluted, requiring a Windows PC or Mac to still do the heavy lifting. One end plugs into the computer and then wirelessy streams to the FlipShareTV set-top box plugged into the TV. That doesn’t sound quite as easy as it should be. Fine for techies but stretching it a little for the type of people for whom the Flip camcorders are so great for in the first place. Perhaps a better option would be to bypass the PC altogether – once content has been uploaded to Flip’s video sharing site – and have the set-top box connect directly to the Internet itself to pull down content to the TV screen. Otherwise, I think the solution that I discovered when I had a Flip MinoHD on loan (see review) is much simpler. Shoot video and then plug the camera directly into a PlayStation 3 or WD Media Player and bingo. Home videos on your telly.